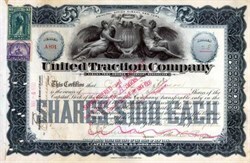 Beautifully engraved certificate from the United Traction Company issued in 1900. This historic document was printed by the American Banknote Company and has an ornate border around it with a vignette of an allegorical man and woman by a shield. This item is hand signed by the Company’s President and Treasurer and is over 102 years old. Electrification of Albany's trolley lines was followed by further expansion and the eventual consolidation of existing rail companies. On November 29, 1899, the Albany Railway, the Troy City Railway, and the Watervliet Turnpike and Railroad Company merged to form the United Traction Company (UTC). Executives of this enterprise represented various facets of Albany's elite consisting of bankers, lawyers, and politicians whose unification brought them strong control over Albany's growth patterns. At this time there were over 100 miles of territory covered by trolleys and interurbans. 6 years later the Delaware & Hudson Company purchased United Traction. The D&H didn't like the fact that the extensive trolley system was competing with their intercity routes. The D&H and NY Central developed an Albany-Troy "Belt Line" with 30 trains travelling each weekday between Albany and Troy and suburbs only 25 minutes apart.